After a 4-year ban, Fuwang Bowling Club reopened its gates to the Underground Music Scene on Friday the 9th's “Rock The Stage” presented by Ucchash and co-ordinated by Shams Quader and Rafatul Bari Labib. It was a great place for the UG music scene lovers, in their uniform of heavy metal concert tee's, to enjoy the good music of various genres from metal to alternative rock with bands like Alternation, Germantown, Machanix, Bohemian, Shunno, Arbovirus, Afterm@th, Powersurge and Artcell with two other bands, Downbreak and Pandora's Box, making their debut. The show opened with Downbreak singing 'Californication' by Red Hot Chilli Peppers. The young (they were all 14!) band were super nervous but still managed to perform the song pretty well. They were followed by Pandora's Box and thus, the growling began! The audience seemed to enjoy it, cheering when the singer let out his shrill 'metal cries'. They were followed by Afterm@th with a more chilled out vibe. Mechanix was up next and we were back to metal! They certainly growled and screeched the house down with the frontman getting immense fan response with every shake of his long thick gorgeously silky hair. Shakira, eat your heart out! They ended their performance with 'Oporajpy', a song from their upcoming album and a cover of 'Painkiller' by Judas Preist. Germantown did two songs ending with 'Sweet Child O Mine' by Guns N' Roses. Playing with them was everyone's favorite Maher from Nemesis with his fantastic guitar solos! The highlights of the night were Alternation, Powersurge and Artcell! Alternation certainly rocked the stage with songs like the Jets 'Gonna Be My Girl' and 'Rong' by The Watson Brothers featuring a cameo performance from Shanto of Old School. Bohemian, one of the best bands to watch live, grooved it up with their own songs 'Cholo Cholo' and 'Nana Primus', along with a cove rof U2'S 'Elevation'. Powersurge did their signature playlist of 'Oprostut Juddho', 'Powersurge', 'Mitther Aggrosion' etc with a cover of Metallica's 'The Memory Remains'. And Artcell ended the show with songs like 'Onno Shomoy', 'Dhushor Shomoy', 'Odekha Shorgo' etc. Artcell fans, and gosh are there A LOT of those, also got to buy 'ARTCELL' t-shirts as band memorabilia at the venue. The show was a success and a great way to 'revive' the UG scene after such a long time. The team would like to thank Fuwang Club, AmaderGaan.com and Checkers DVD store for all their help. Lets hope this is the beginning of a lot more UG shows to come! The long wait was finally over. 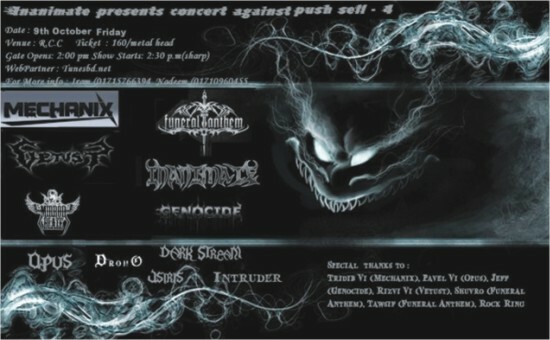 After the huge separation of about two months, the metal heads were at last able to let go of their impatience last Friday at the latest edition of “Concert against Push Sell- 4”. Albeit an event that was did not get its deserved share of advertising, it was still able to draw a full house. As its name says, this event was a collection of bands to advocate against the corrupt push sell system in the underground music scene. A huge number of people crowded the area in front of the Mother of All Underground Gig Houses, The Russian Cultural Centre, better known as the RCC. Right from the word “Go”, debutant bands Zaedron and Heresy marked their presence with terrific covers and instrument playing. These terrific performances were followed by Osiris, Intruder, Droho, and Genocide heating up the place with talents of their own. As the earlier half of the line-up showcased their talents, it was up to the latter half to raise the bars even higher. The job was promising indeed. Opus, consisting of most “higher-ups” in this fraternity, but dormant for a long time, showed some cool works with enough composure and gave the crowd what was expected. And Inanimate proved to be an example since their performance lived up to the concert's theme and they did some heavy thrash numbers and tried to maintain their habit of not doing commercial numbers and instead sticking to their own values. The headliner, Mechanix proved once again why they are so crowd-pleasing by bringing out the beast out of the fatigued crowd who had been head banging and 'moshpit'-ing from 2:30 PM to 8:00 PM. Vetust kept their names as they satisfied the crowd up to the brim. However it was Mirror Blaze and Funeral Anthem who stole the whole show. While Mirror Blaze received the full energy and noises from the Thrash metal lovers, Funeral Anthem got a standing ovation from the whole of RCC. Afif, Mirror Blaze's vocalist was performing and the audience fed off his extreme energy. Drums and bass were extraordinarily precise. Mirror Blaze announced, “Now you have got something to die for” and the crowd did get so. Moving on to Funeral Anthem; returning after three long months, made quite a comeback. When they said it was going to be a Dragonforce cover, eyebrows were raised since no one had ever dared to cover this extreme power metal band in this country. Immediately all focus was on the dynamic duo lead guitarists, Arunav Shuvro and Tawsif Hyder, and also drummer Oyon who had to pull out the extreme tempo of the song. There were trademark Bodom covers from Funeral Anthem and full house chorused together “Every time I Die”. Vocalist Faiyaz, Maruf Rashid Khan on keys and Tanvir Kaiyum's fiery fingers on bass were bang on their job. All in all, a great show for an extreme evening, with a novel theme, and what with so many crowd-pleasing bands from the Underground scene and full houses, this Concert was worth the huge wait for, and forthcoming events will too.